Hiking up one of Hawaii's most famous volcano's was definitely a highlight of the trip! 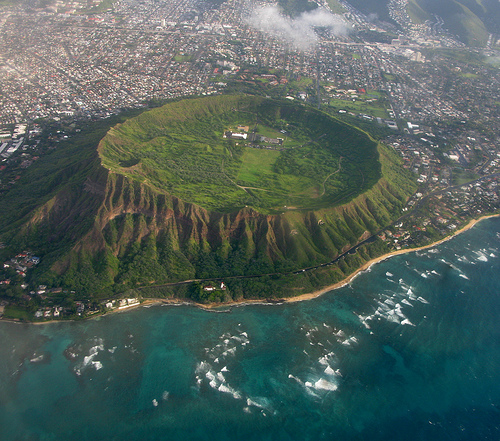 The crater, called Diamond Head, is the remainder of a volcanic explosion that took place over 500,000 years ago. Pretty amazing to hike up inside of it and get to the top to see a spectacular panoramic view of the island. The hike took about 45 minutes and wasn't too bad but we definitely got a good little workout in. The payoff was beautiful! The hiking trail going up! We started in the middle of the crater and made our way up. It's about 1.5 miles up. Great way to get a workout in! Later that day, we went snorkeling here at Hanauma Bay. All those dark areas in the turquoise waters are live coral reef. It was pretty cold due to the strong winds but we still got in and saw some pretty fish. We bought an underwater camera which we've yet to develop, but will show you when I get them in! The sites were surreal. Annie! Your pictures are wonderful, where is your blouse from? Hope you enjoy your vacation! These pictures are amazing!! Looks like you had a truly wonderful time!! I miss you so much Annie...but looking at your pictures have helped me stay on track and follow my healthy routine. I hope you spoil us with a new video soon. WOW!!! THESE ARE AMAZING PICTURES! Me and my friends love watching your videos, there really good advice and we love watching room tours on you tube and since your our favourite channel out of all the other ones on you tube we would think it would be really good idea for you to do a room tour! Its so interesting watching people doing room tours so please, please, please do a room tour.